Coconut and chocolate are all my kids favorites. Gotta try this recipe at home. Thanks so much for sharing! That chocolate coconut fudge looks super yummy, I might even try to cook some myself! Is there a way you can make this recipe a white chocolate fudge? I cannot have regular chocolate bc of the caffeine and histamines…. In the Coconut Cream Chocolate Fudge recipe the ingredient listed is coconut butter. Step one says coconut cream concentrate or butter. Are they used interchangeably in equal amounts? In the recipe for Coconut Cream Chocolate Fudge the ingredient listed is coconut butter. Step 1 states coconut cream. Are they used interchangeably in equal amounts? Thanks so much for this!! We’ve been enjoying it for a few days now, and just a little piece is so decadent 🙂 We used raw cacao powder and it worked very well. As to the clumping, I found that less heat was better and taking it off of the stovetop when adding the honey helped- I was able to add the honey and could stir to make it consistent throughout- although it was very thick, it was easy to pat/press into the pan (but much harder to wait for it to harden to try a piece!!). Thanks for the delicious recipe. Someone said in the comments that it tastes like a tootsie roll which I didn’t find to be true at all. It’s rich and chocolaty with a distinct coconut flavour kind of like the taste of an almond joy only way better! For those who had problems with the seizing up. It almost happened to me too. I think the problem was that I was trying to melt my coconut butter to measure it properly and it got too hot and then adding the cocoa powder and keeping it on the heat made it start to get clumpy. I took it off the heat after the coconut butter was melted and added the cocoa powder and vanilla. I used maple syrup instead of honey and I warmed the maple syrup separately and added it to the coconut, I think adding a cold liquid into the coconut butter would also make it seize up. Anyway’s, it turned out amazing and you rock, coconut mama! PS, I really think it’s essential to use good quality cocoa powder like you recommended, I used Camino and the taste is just so yummy! Was I suppose to melt the coconut cream completely, as soon as I added the cocoa, it clumped up! You rock!!! My husband is loving my new found love of coconut. I have already enjoyed using coconut oil with my essential oils (my first oil love), but now my cooking possibilities are endless with coconut oil. Thanks you for all your great info! This recipe looks fabulous! Plus, it is just in time for the holidays right around the corner. My daughter nor myself can eat dairy or gluten so I’m always on a hunt for fun things we can make and she will love! Wow! 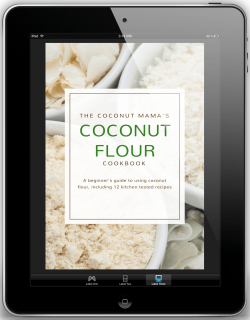 My first recipe with coconut butter…and a dessert without flour, sugar or butter in it! Yahoo! My dad and Gram were shocked to learn how natural this is…and YUMMY too! I didn’t have enough coconut butter to complete the 1 1/2 cups so I substituted almost a 1/2 cup of peanut butter. Also, as I saw another reviewer do, I added a few tbsp of coconut flakes and chopped pecans. We will definitely be using this recipe for years to come. THANK YOU! I’m crazy for coconut butter! I love it on my oatmeal, and just plain on a spoon! I’m trying to incorporate more raw foods into my diet, and found this super easy, delicious, and nutritious fudge recipe. I replaced about half of the raw honey, and added pure maple syrup (just because I love pure maple syrup), and also used raw organic cacao powder to boost it’s nutritional value. I just have to say, thank you Coconut Mama….it’s the best fudge ever!!! Hey Coconut mama! I would love to feature this recipe on my blog. However I was wondering if you have any suggestions on whether coconut oil, coconut butter, or full fat coconut milk work best in this. Let me know! Thanks! 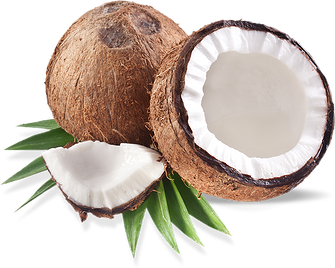 Is coconut butter the same as coconut cream concentrate (Tropical Traditions) If no, what is the difference? I get confused by all the different names…. Coconut Oil, coconut butter, coconut cream, cacao butter, ect. I have made this a couple times. Very yummy. I also tried doing just 1 cup coconut butter and then added 1/2 cup peanut butter it was pretty awesome and a bit softer. Next time I think I’ll add mint extract for mint fudge 🙂 Thanks so much for this recipe! Hi coconut mama, I really love the idea of this recipe but twice now it hasn’t turned out right. First my creamed coconut (what we call it in the UK) took a very long time to melt, in fact it started to smell toasted. It wouldn’t completely melt, so I added some coconut oil to loosen it as it just wasn’t liquid. Got it just about liquid but very thick, and as soon as I added the honey it just turned into a dough-like consistency! I will chill it anyway to see how it turns out but it’s really grainy, it definitely won’t be smooth! Any ideas where I’m going wrong? I just made this Friday night as my first food processor / coconut butter recipe. Due to a nice glass of vodka, I burnt my first batch but was DETERMINED to get this right! The second batch turned out great, even though I had only enough coconut butter left to do 1/5 of the recipe, making it more of a fudge-bark. Long story short – DELICIOUS and I LOVE YOUR BLOG. Hi Dana! When I first read your comment I thought you had put vodka INTO the recipe hah! I’m so glad it turned out for you though! Tried to make this last night. It did not turn out, even though I followed the instructions to a ‘T’ (I’m an experienced cook & baker). I think the problem was adding both the coconut butter AND the cocoa in first, when the coconut butter should have been added by itself first until it was fully melted. Moreover, I think the amount of coconut butter might need to be increased, since once I added the cocoa, it chunked up, and the honey did not do much to break up the chunkiness of it at that point. I’m sorry you had trouble with the recipe. I’ve made this so many times and I’ve never had a batch not turn out. What type of coconut butter did you use? Store bought? Homemade? Did you let it melt completely? Why do the first two pictures vary so greatly? What did you add to the recipe in the first picture? I added shredded coconut and pecans. OMG. I made this and added some crunchy peanut butter! Love this 🙂 thank you for this great recipe! I used 3 cups of coconut to make my coconut butter, but only produced 1 cup of coconut butter, so I supplemented with sunflower seed butter for this recipe. It was super yummy! Thank you so much! How do you measure coconut butter to 1 1/2 cups? Do you measure when it’s cold or melted? What is coconut cream concentrate? can you please post a link so that we can actually see a product and if not – can you tell us how to make it? can these fudge stars go in a snackbox or will they become to soft? There are links in the post that direct you to my recipe for how to make coconut butter and where to buy it. Do you think powdered Truvia would be okay as a honey substitute? I can’t have any honey, agave, maple syrup, cane sugar, real sugar, date sugar…..but Stevia and Truvia YES! Trying to make this work somehow…. I’m sure stevia would work great! Oh, this looks fantastic. Found your recipe from your comment at Lydia’s Divine Health from the Inside Out. My wife and I made this coconut fudge and we love it! Good thing we found some coconut butter. We used unsweetened Hershey’s cocoa powder. I think this is perfect for our primal way of eating. Thanks so much for sharing this delicious recipe! I love coconut! I used cocout oil instead of cream and it kinda turned out a little different. Its white on the top and black on the bottom, lol. Next time I will have to try with the coconut cream. I missed this recipe last week. I am so glad it was highlighted this week on GNOWFGLINS. It is going on my to make list. I wish I could have some now! This looks great! Off to try it now…. How fun and all natural. Love it. This would so hit the spot! It looks amazing. I don’t think I could keep my daughter away from it either. How about that? I’ve been thinking I need a new fudge recipe to fit out new healthier diet AND BAM! You have one right here! You are a mind reader! Ha ha, love the pic! This is an awesome option as well!